This is the next evolution and the future to the martial arts/military/combat/special forces training. We developed this program nearly 15 years ago and feel that it is the right time to go worldwide. 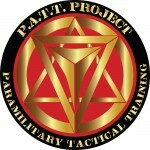 The Patt Project is a very comprehensive and adaptable program which uses elements from Ninpo, NInjutsu, Samurai jujutsu, Karate, MMA, Kali, Grappling and other hand-to-hand combat measures and strategy. A complete program from marching. saluting, strategy, training, survival, and living. There are no prearranged forms as in karate but prearranged fighting routines which are practiced solo and then upon direct application to one or more volunteers. These prearranged short moves are applicable to empty-hand, weapons and escaping methodologies in a confrontation or assault. The uniform for training is the camouflaged fatigue used in the military. During operations (OPS) one must be mindful of the use of fatigue as create maximum invisibility and congruency with the intent of the operation (anything goes to blend in).